A Premium Quality Dog Leash That Puts You In Control If you're looking for a comfortable, easy to use, retractable dog leash that keeps your dog under control, then this is the leash for you. 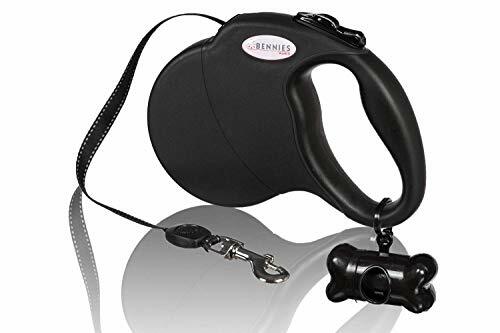 It has an incredibly strong internal mechanism that lets you decide exactly how far your dog is allowed to wander, and a sturdy, comfortable grip that makes dog walking fun. The Freedom To Roam, But Close When You Need To The button on top of the leash lets you control the heavy duty spring mechanism inside. With the button released, the tough nylon extends and your dog is free to wander up to 16ft away. You can push the button down to limit the length of the leash, and click it back to easily draw your dog closer to you. The internal spring is heavy duty enough to control large, energetic dogs and give you full control at the tip of your thumb. It's so tough that it can even perform in minus 86 degree conditions. 100% Lifetime Money Back Guarantee We care about our customers and stand behind the quality of our products. That's why we're offering a 30 day money back guarantee. If you aren't satisfied with this leash, within this time any reason, then simply return it to us for a replacement or full refund. That means you and your dog can try it out at absolutely no risk. Take Control - Try This Retractable Leash Today! If you have any questions about this product by Bennies World, contact us by completing and submitting the form below. If you are looking for a specif part number, please include it with your message.